Fun for little hamsters, a photo by PhylB on Flickr. We've just had the most stressful forty minutes of pet-parenting since we brought little Rosie home just three months ago. 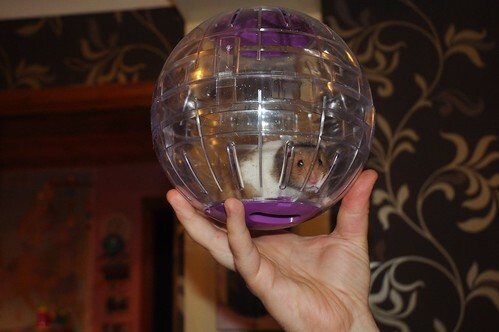 As we often do around midnight, we let her out to explore in her ball. Thomas and I were looking at photos from our trip to Stirling castle when all went quiet. She must have undone the lid and got out her ball. Thomas wandered through and found the open ball in the living room. This is only the second time she's ever escaped and the first she came in and told us! So for five minutes we search with handfuls of food till suddenly I came face to face with her in the living room. She was happily but quietly exploring. She walked by me and into the bathroom so I pointed her out and returned to bed expecting Thomas to scoop her up. Of course, because she was just calmly sniffing around he didn't rush her so as not to frighten her, carrying on his conversation with me and suddenly she was nowhere to be seen. Had she nipped past him? Fifteen frantic minutes led to the front of the bath being removed and the water pipes moving from the hole they disappeared into. We worked out she'd got under the floor but we didn't know if the drop beneath the pipes was 5cm or 50cm. I tried to coax her out with dried food then cucumber and she was desperately trying to grab it to pull herself out. Next a stick was brought in but she couldn't grip that either. Then it stopped moving and everything went silent. OMFG. Suddenly I noticed the pipes behind the wash hand basin moving. I could see her nose but the hole was too small. Fortunately the piping was soft plastic so I squeezed it as flat as I could just long enough for her to heave herself through the tiny gap, a bit dusty, a bit panicked and she didn't even object when Thomas grabbed her round the waist and picked her up. She's now safely back in her cage having a long wash and looking very relieved after her ordeal. I don't think I'll be mentioning it to the kids. I'm still trying to imagine if she'd got stuck there permanently. That was so stressful. I think we're all too attached to our wee hamster to have her starve to death trapped under the bathroom floor.